Why are materials so important? Materials have the potential to draw you in, make you want to stay a while, explore a little (or a lot), try new things, create and wonder. They also have the potential to completely turn you away. 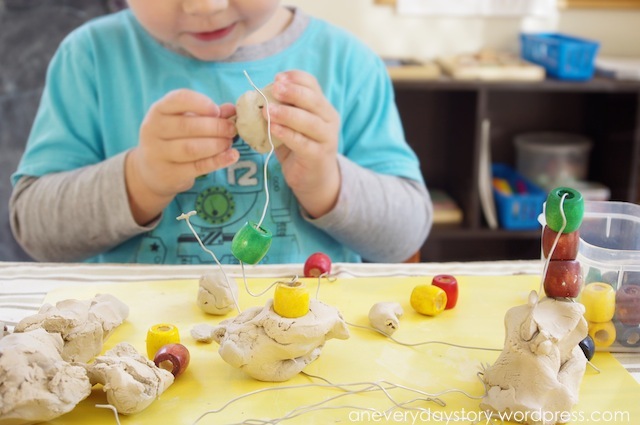 In a Reggio-inspired environment, as with many other play-based, child-led environments, the materials are carefully selected for their potential to enhance learning and discovery. The way we think about materials really reflects how we think about children; what do children deserve? What are they capable of? How will they approach the materials? Treat the materials? Materials are chosen for their aesthetic qualities; what do they look like? Feel like? Smell like? Do they have a unique quality of their own? Are they derived from nature? Can the child connect with the material in some way? Many materials used in a Reggio-inspired environment are common and easily found in craft/art/hardware stores or indeed, out in nature. It’s when you start to think differently about learning, about what activities or explorations you present to your child, that you start to see the potential in these materials as tools for learning and discovery. Like little treasures for the child to explore, presented with an air of wonder. Children, like us, love to stumble across and explore beautiful things. Why give the children cheap plastic or ‘kiddy’ versions of a material when they would much prefer to explore the real thing. With guidance and support, children can be trusted to work with breakable items like vases and mirrors as well as delve into beautifully illustrated books, handle delicate items like glass beads, flowers, authentic musical instruments, or work with art materials like pastels, watercolours, fine paint brushes or permanent fine-tipped markers. You hear this a lot but what does it mean? For me, open-ended means a material that can be transformed. A material that when left alone, does nothing in particular but comes to life in the hands of a child. Materials that require the child to use their imagination or their experiences. A block that is shaped and painted like a tree is more likely to be played with as a tree, however a simple wooden block can be transformed into any multitude of things. While I think there is value in having the tree-shaped block, open-ended materials greatly enhance the play experience as they require the child to bring themselves into the play experience in a deeper way. Add some play silks and scarves to your dress-up box. They will compliment the costumes your might already have as well as have the potential to be any and all things. When creating a small world imaginative play scene, rather than adding all the elements from plastic play toys, try using reusables like cardboard tubes, popsicle sticks, cotton wool or natural materials like rocks, sticks, pinecones, bark and leaves. Leave scope for your child to arrange and engage with the materials. You might like to add a few animal or people figurines but try not to define the play scene too much. You want your child to make it their own and explore in their own way. Add natural materials to your play area. Try to have them dotted around where ever your children play. Natural materials have wonderful aesthetic qualities. They stimulate the senses by how they feel, smell and look. 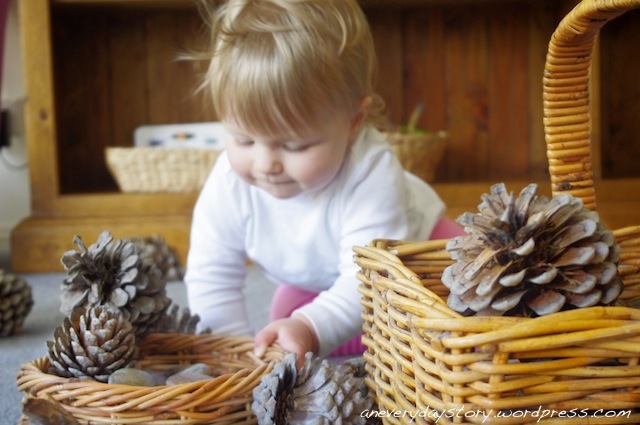 Add a basket of pebbles to the block area and see how your child incorporates them into their play. Rolka blocks (or other kinds of plank blocks) are wonderful open-ended materials. Endless possibilities for construction. Treasures. If you find something beautiful, a vase or a stone or a starfish; anything that captures your attention, is likely to capture the attention of your child, too. Pop it into their play area and let them explore. Try to think beyond its general purpose and let your child explore/play with it in their own way. What are your favourite open-ended materials? I go to Micheal’s and buy sea shells, large size glass pebbles, smooth river rocks, moss, etc. Inexpensive and great to add to block centres and art shelves! Absolutely right. These simple stuff are treasures for us. I teach in a reggio inspired preschool classroom in the states. One of my kids’ favorite open ended materials is the flat marbles that interior designers use as fillers for vases of flowers. They love to use them in the hose area and make ‘soup’ we use them as counters for math activities. I also want to try to mod podge letters on the bottom so we can use them for literacy. I have a large crystal collection with a mixture of smooth and rough stones of all sorts of colors and shapes. My toddler loves exploring them. We have a small collection of stones and gems but I would really like to get some more. They are so beautiful, aren’t they? Yes, and it’s so hard to keep myself from buying too many when I’m in a crystal shop. I am having a hard time finding natural materials that are big enough that they are not a choking hazard for my toddlers. Even some bigger things (like, recently pine cones) they bite chunks off of. Sarah would mouth everything too. When she was younger I still wanted her to have the opportunity to explore these beautiful materials and so I would make them available to her at eye-level – she could see them but couldn’t reach them independently. So we would always play with them together. I would often remind her that she could put the pinecone or rock or whatever on her face and even on her mouth, but not in her mouth. She like being able to feel the different textures of the materials on her skin. My question was the same as Shannon’s. My 15 month old eats everything so how do I safely incorporate these materials? Sarah would mouth everything too. I think it is particularly important though for toddlers to be exposed to a variety of differently textured materials for them to explore. I avoided small pebbles but things like leaves, sticks, large shells, flowers… are all so very interesting to toddlers. I really wanted Sarah to experience all the wonderful smells and textures of natural materials so I made sure I actively supervised her while she was still mouthing everything. Just a suggestion … If you set a variety of rocks, pebbles, shells, marbles, etc in shallow trays of plaster-of-paris, the young child still gets the pleasure of the sensory experience without the danger of swallowing the items. Make sure the objects are protruding from the plaster so that they are as 3D as possible but can’t come loose. This is a great sensory experience for babies and toddlers and a wonderful introduction to nature-based sensory experiences. Older children love to be involved in the making of the moulds – ask them to place the objects in the plaster in a pattern or random arrangement of their choice. A wonderful creative experience for individual children which can become a collaborative project when 20 bricks are created and displayed collectively in the classroom. Do you have any suggestions for how to teach children to respect, and appreciate the materials.